After a sudden surge in blockchain adoption within food supply chain in the last quarter of 2017, the momentum seems to have continued in the first quarter of 2018. 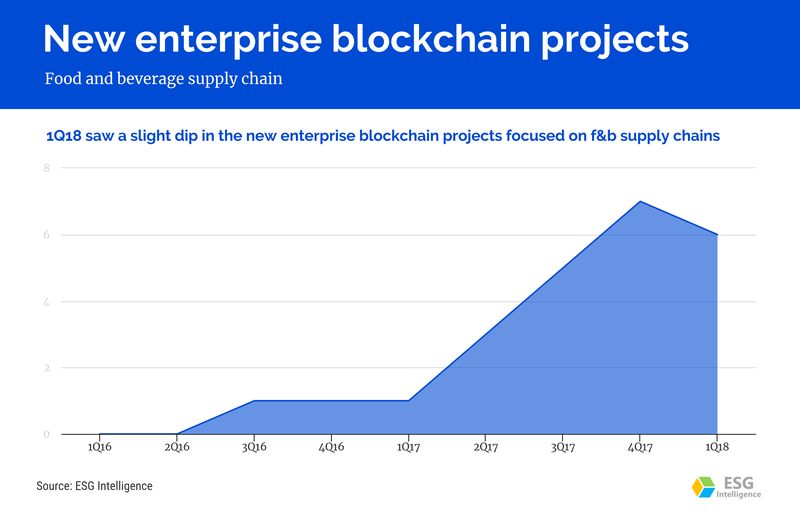 Here are some trends related to the enterprise blockchain adoption for projects related to food and beverage supply chains. Strong handover from previous quarter: 4Q17 had seen seven new enterprise blockchain projects focused on food and beverage supply chain. These projects were started by various industry stakeholders that included restaurant chains, government organizations, NGOs, food retailers, and beverage companies, among others. The seeds of this strong adoption were sown in the previous quarter, in which IBM and a consortium of several large food companies and retailers came together with IBM to test the technology. A weak start to the quarter in January: Post the holidays, the first quarter of 2018 started sedately as January was a relatively calm month. This also coincided with the downtrend that was being witnessed in the crypto market, as bitcoin and ether prices crashed significantly from their December highs. Beverage giants boost adoption in the latter half of the quarter: However, the two trends soon disassociated. Even as the crypto market continued to dwindle and stumble during the remainder of the quarter, the enterprises stood behind the technology strongly. The quarter saw six new enterprise blockchain projects, announced by a variety of industry stakeholders. However, the quarter was dominated by the confidence shown by leading beverage giants in this technology. Balanced mix of local and global initiatives: The global footprint of the projects announced during the quarter was a mix of some regional initiatives and some large initiatives that will address global, highly complex supply chains. Blockchain plus IoT emerging as a template: We have also seen an increasing trend of projects where the blockchain technology is being used in tandem with IoT. We believe that the food and beverage supply chain can perhaps be the best template for how these two emerging technologies can complement each other. Vendor ecosystem seems pretty diverse: If we look at the overall vendor selection trend, for all projects, we note that large and established IT and consulting vendors continue to be a preferred choice for projects where some sort of consortia are involved. At the same time, some large players from the food as well as retail industry, have also initiated in-house projects. The third category is of the small niche vendors being entrusted by individual enterprises for specific, mostly regional applications. ESG Intelligence closely tracks the enterprise blockchain adoption across different industries, countries, and applications. We have provided sourcing intelligence to several senior IT decision makers, who are exploring the adoption of this technology. Our database of ~400 enterprise blockchain projects and ~200 enterprise blockchain vendors make us the right source to start your blockchain research. We will continue to publish similar articles to discuss the trends in enterprise blockchain adoption in various industries, geographies, or related to specific applications. Please subscribe to our viewpoint, by submitting your email address in the right menu. Also, explore our food supply chain management dashboard.